SBA Announces International Street Ball Federation. Initial Coaltion Consists of 25 Members Representing 20 Countries on 6 Continents The SBA was very pleased with the participation of individuals and organizations in the Street Basketball Federation Conference call on February 16, 2009. A total of 22 individuals from the following international jurisdictions/countries were party to the conference call and signed on as members of the new "sanctioning body". United Kingdom, Australia, New Zealand, Nigeria, The Gambia, Ghana, Russia, Latvia, France, Germany, Poland, Lithuania, Holland/Netherlands, Estonia, Spain, China, Brazil, Ecuador, Puerto Rico, West Coast United States, South East United States and the SBA Executive Team. 1. Adoption as the SBA logo as the official brand of Global "streetball"
3. 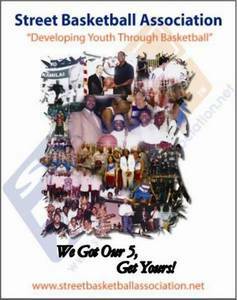 Development of officially sanctioned "streetball" tour with an elite (world's best players) "streetball" all-star team. The 2 year tour will travel and promote the "streetball" industry on 6 continents. 4. Plan for re-launching the world's first Professional "streetball" league in 12-24 U.S. cities in summer 2010. We look forward to this new chapter of growth in the "streetball" industry.